This is our second time visiting Indiana Dunes State Park (but first time for the twins). We like it because there is a Nature Center, some gorgeous trails, access to Lake Michigan, and a commuter train into Chicago. The boys liked it because there is dirt and sand, piles of it! I picked up a bucket of pirates at Toys R Us with a gift card the boys had received from my aunt and uncle for Christmas. 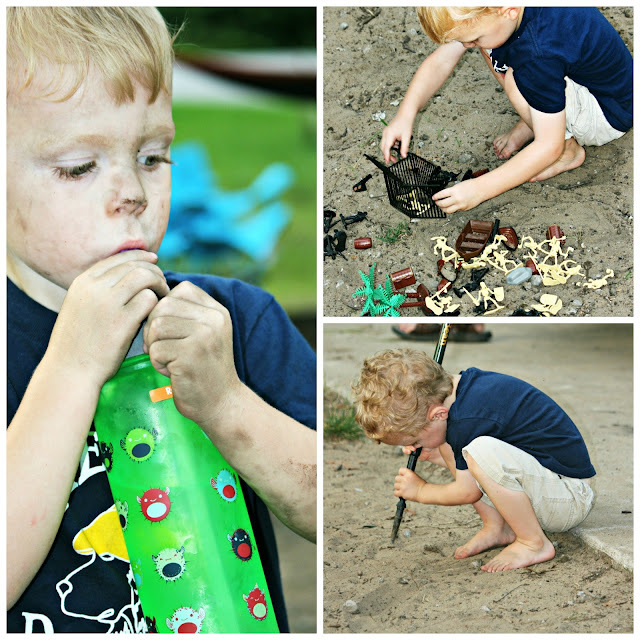 That bucket of pirates was just perfect for some sandy play around our campsite. So I'm pretty sure the motto of almost all little boys, everywhere, is "the more dirt the better". Thankfully, the campground had a bath house with showers. We also had some very early morning visitors. Seems they were the only other two critters around the campground that were still on eastern standard time zone and up at 5:00 am. 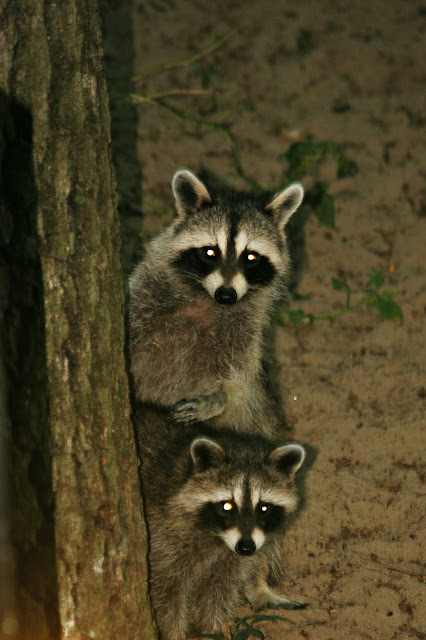 Readers, have you seen any raccoons lately? Dirt can be such fun to play in, no batteries required! Oh yes just lastnight ! The critters are out ! Have a great day Lisa !!! The boys are growing! So cute. No unusual critters around the house -- but I know they are down by the pond and on the lane daily/nightly. Our last camping trip we heard a visitor, thought it was a raccoon, looked out the window at it was a skunk! We decided it was best to just leave him alone! I know a boy who would love to play in the dirt with them. The boys look like they are having a blast. We recently saw a deer and a bunny in our new yard. Your boys are so cute. It is so delightful how they don't let worry about getting dirty keep them from having fun. No raccoons here that I have seen but they are probably out there. You got a good photo of them. We haven't seen any raccoons this year, but we did receive a notice from the county two weeks ago that a rabid one was caught very near our property. They sure are little cuties though! Looks so fun! I see raccoons regularly at my house. They like to come up on the back porch and eat any food the cat leaves! Haven't seen any raccoon's lately. It must be over 40 years since I've been to the Indiana Dunes. We use to go there all the time with our friends in H.S. Looks like a fun time. Nope, no racoons seen here lately. But plenty of rats...and an assortment of flattened fauna. The pictures could be on the cover of a magazine telling about what little boys are and do! Loved all of them. Oh my gosh, this is the cutest raccoon picture EVER!!! We don't have any raccoons. But we have bears, skunks, beavers, groundhogs, deer, and rabbits. You got them the perfect dirt toys! It is quite bad when you are camping without a bath house! We actually started to do an Indiana Dunes and Chicago trip through vacation and ended up going a different direction. I had read about a sand dune..think it's called Mt. Baldy that sounded really cool! We camp a lot and our local campground doesn't have many raccoons but we see LOTS of skunks!!! Ha, we judge park quality by dirt and sand as well. And, I hope those visitors did not get anything shiny of yours. I've been to the Indiana Dunes. My hubby grew up in Indiana --so he took me there about 10 yrs. ago... We visited the dunes. Your boys and the raccoons are adorable! During some of my wildlife volunteering I was up close to itty bitty baby raccoons and they love to wrap their little fingers around your finger. They are so sweet! We do have raccoons (and lots of other critters) around here, but I haven't see them recently. We were sitting in the family room one evening when we heard a big crashing sound coming from the garage. It turned out to be a big ol' raccoon, and he had knocked the garbage can over. What a mess. Naughty raccoon! But it serves us right for not making sure the door was closed properly. Oh Lisa, these photos are priceless. So dang cute! Such great memories you've made for your dear boys. We didn't see any racoons at the beach this last time, but as I was reading indoors one evening a bat flew right by and landed in the dining room. We gently caught it in a plastic bag and put it back outside. A bucket of pirates, and dirt-I bet your cutie pies were in seventh heaven!! None around here...they are cute though! Wish I knew you were in the 'hood--we could have met up!! We are in the south suburbs of Chicago.